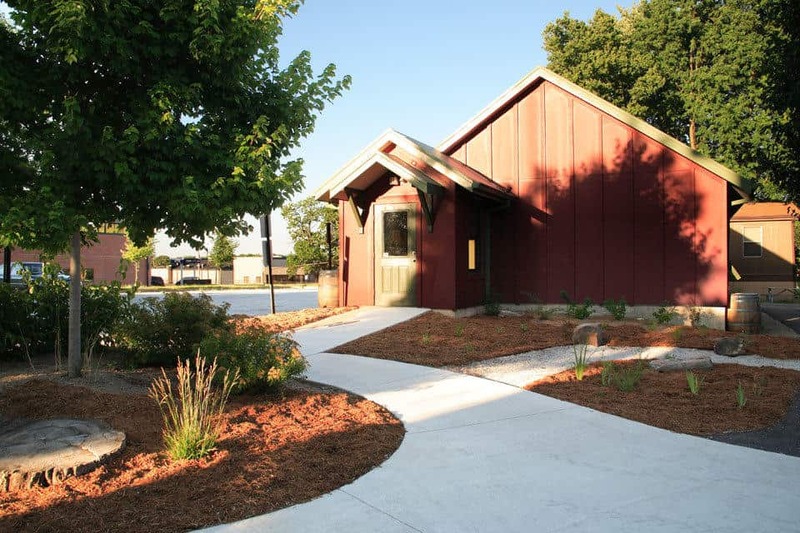 The Eco Schoolhouse - Columbia Public Schools - PWArchitects, Inc. When the Columbia Public School District lost an overflow classroom trailer to an arson fire in 2007, PWA proposed replacing it in a way that would best serve the School District, teachers and children. 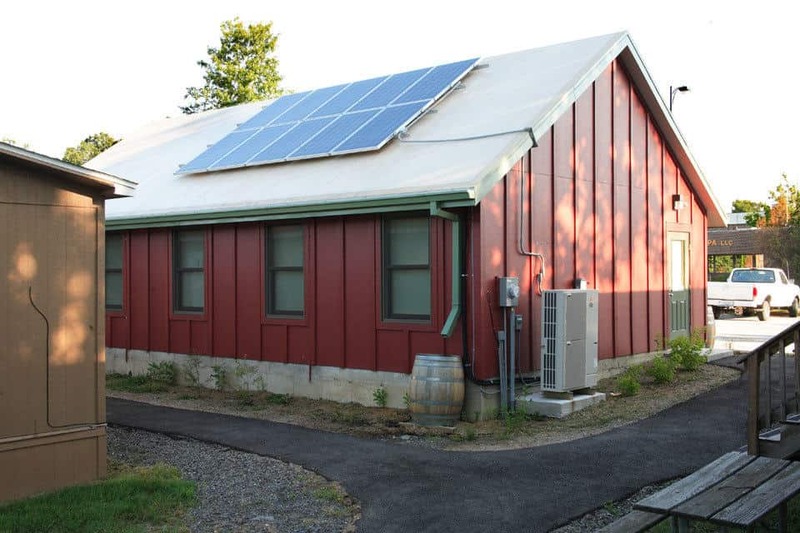 The Eco Schoolhouse, an energy-efficient building designed as an alternative to trailer classrooms, is a cooperative collaboration with the School District and leaders in the design and construction community. 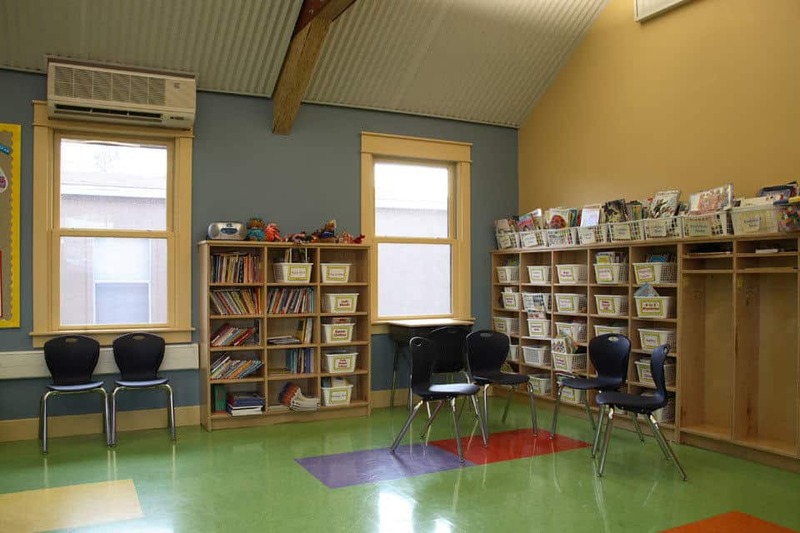 The building, prominently located on a major street adjacent to the 100-year-old Grant Elementary School, offers the public a tangible example of the school’s sustainability focus. With a design that has achieved the U.S. Green Building Council’s LEED® (Leadership in Energy and Environmental Design) Gold Certification, the school has become a teaching tool, allowing students to see, touch, and learn about the building’s environmental and socially sustainable components. 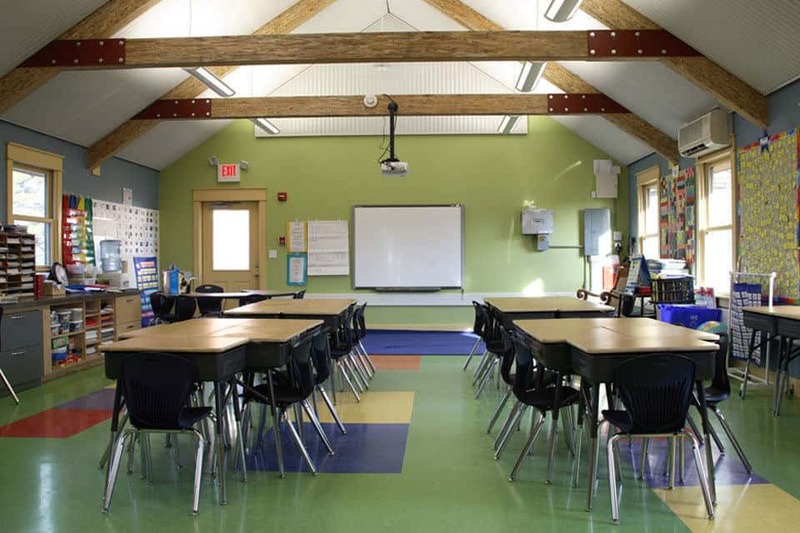 Skylights and indirect, energy-efficient lighting fixtures provide a well-lit and calming classroom atmosphere. Built-in recycling station encourages sustainable practices. Floor tile, a low-emitting, durable and rapidly renewable, domestically grown corn product, lowers maintenance costs and improves indoor air quality. Energy Recovery Unit captures energy from exhaust air to pretreat incoming air, while the CO2 Sensor monitors air quality and controls fresh air supply on demand. Airlock Entry reduces air infiltration. Native plantings require less water and maintenance. Photovoltaic panels supply roughly 36% of the building’s power needs. Roof reflects heat and lowers the building’s cooling load. Recycled aluminum acoustical panels improve the building’s sound quality. Durable, waste reducing, prefabricated SIP construction with a vapor barrier minimizes air/water infiltration and maximizes thermal efficiency. Energy-efficient heat pump enhances low-temperature heating capability. 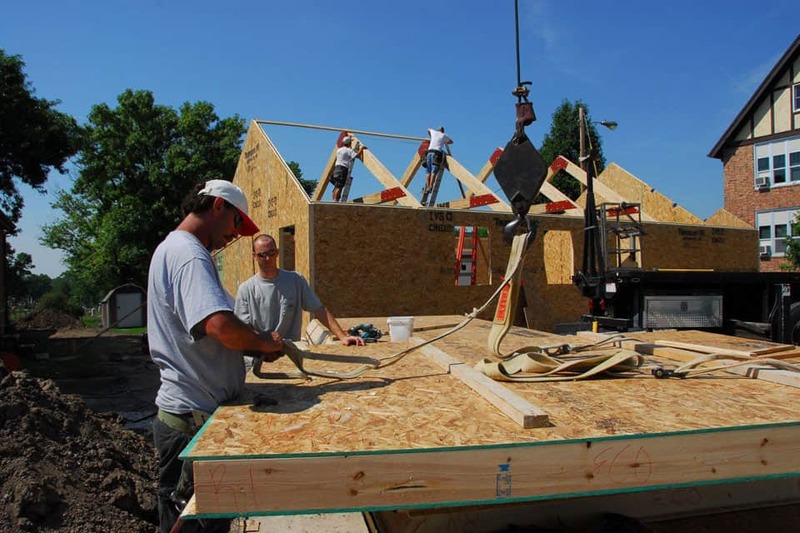 Windows provide natural daylighting and cross-ventilation while roof overhangs reduce harsh light and heat. Low VOC paints and coatings improve indoor air quality. 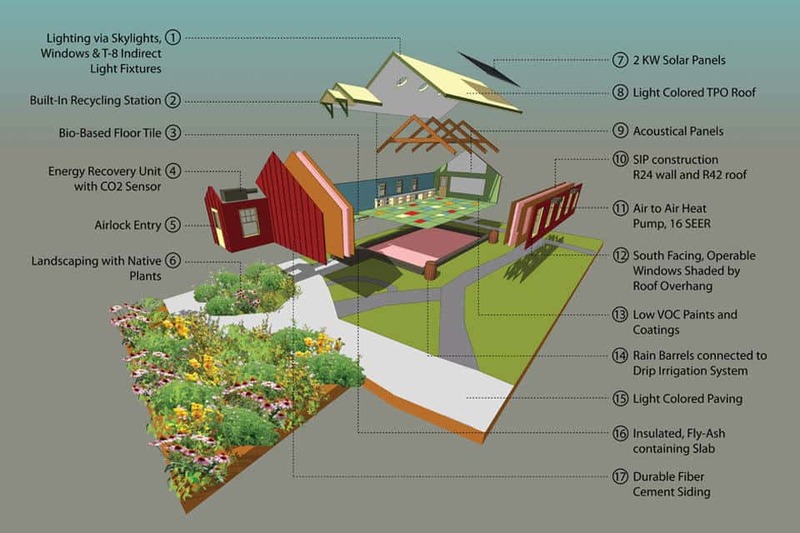 Rain barrels capture water and a drip irrigation efficiently funnels water to the landscape. Light-colored concrete paving helps moderate exterior air temperature. Fly-ash, a post-industrial recycled product, improves concrete performance. Durable fiber cement siding lasts longer and requires less maintenance than traditional vinyl siding.